A surprise boost in optimism is impacting financial markets and has the potential to feed into growth as we start 2017. 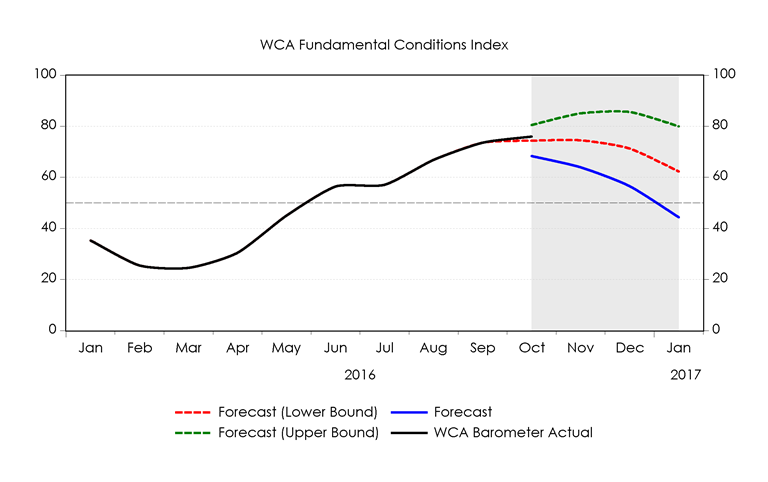 The WCA Fundamental Conditions Index ends 2016 on a strong footing, suggesting better growth through the fourth quarter. Today’s Monday Morning Minute will be our last weekly commentary of the year, and we would like to say thank you to all our readers. Our best wishes to you for a joyous holiday season and a prosperous 2017! Our final update is also a positive one for the stock market and the economy. Although the year started off with a whimper, economic momentum started to pick up around mid-year. A further surge in confidence post-election reflects hopes of a fiscal push in late 2017 or 2018 through a variety of tax cuts, regulatory reform, and spending proposals. 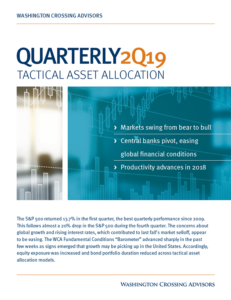 Rallies across equity, credit, and oil markets, along with a rise in the U.S. dollar, underscore this attitudinal shift. 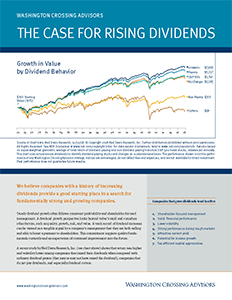 As we discussed in previous commentaries, the increased potential for a cut in corporate taxes is directly beneficial to shareholders and indirectly beneficial for long-run growth. Lowering of taxes not only directly lifts after-tax earnings, but the more favorable treatment of capital investment has the potential to enliven growth in capital formation across the economy at large, lifting long-run growth potential. Back in the here-and-now, however, we continue to look for signs of changes in the outlook through the lens of our WCA Fundamental Conditions Index (graph, below). As readings moved north through the summer and into the fall, we moved to overweight U.S. equities and underweighted long-term Treasuries. Our models suggest that the lift in growth should begin to moderate as we head toward the start of the year. The sharp improvement in risk attitude since the November 8 election will likely provide some additional lift to the barometer as we head into the new year, suggesting a smaller likelihood of a recession. We suspect that once this confidence boost shows up in real data, the barometer will trend upward toward the upper bound indicated in the graph. Most of the improvement in recent weeks is reflected in financial markets rather than economic data. A “risk-on” environment has caused a sharp jump in stock prices, a large drop in credit spreads, a rise in inflation expectations, a ratcheting higher of earnings forecasts, a lifting of commodity prices, and a steepening of the yield curve. The Federal Reserve (Fed), taking its cue from the data responded by raising rates last week, is striking a more hawkish tone regarding the future path of interest rates. Long-term bond yields have backed up dramatically, reflecting a pricing in of reflation and better growth. The next step will be to see actual economic data pick up. The Federal Reserve Bank of Atlanta’s “GDP Now” service, pins fourth quarter GDP near 2.6%. Given the miserable ~1% pace of growth at the start of the year, it is nice to see growth and optimism picking up as we close out the year. Based on our long-run capital market expectations, the “core” equity allocation in portfolios are underweight foreign equities / overweight large cap domestic growth, and underweight REITs / overweight Gold. The “core” bond allocation is underweight long-term Treasuries / overweight corporate high-yield bonds.